Anatomy of Hatha Yoga is the only modern authoritative source that correlates the study of hatha yoga with anatomy and physiology. Hatha yoga is comprised of stretching, strengthening and breathing exercises in upright, lying down and inverted postures. Yoga teachers and students, personal trainers, medical therapists, or anyone who is curious or troubled about how the body responds to stretching and exercise will find in this book a cornucopia -- partly new and partly old -- of readable and reliable information. It was written and edited to meet the needs of a general audience largely unschooled in the biomechanical sciences, and yet to attract and challenge the interests of the medical profession. This book features 230 black and white photographs and more than 120 diagrams and anatomical illustrations. 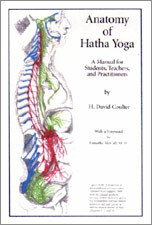 Chapter 1 summarizes general principles of anatomy and physiology as applied to hatha yoga. Breathing is next in chapter 2 because yogic breathing expedites movement and posture. Breathing is followed by pelvic and abdominal exercises in chapter 3 because the pelvis and abdomen form the foundation of the body. Standing postures will then be covered in chapter 4 because these poses are so important for beginning students, and because they provide a preview of backbending, forward bending, and twisting postures, which are covered in detail in chapters 5, 6, and 7. The headstand and shoulderstand, including an introduction to cardiovascular function, are presented in chapters 8 and 9. Postures for relaxation and meditation are treated last in chapter 10. WINNER, 2002 Benjamin Franklin Award for Health Wellness, and Nutrition - Publishers Marketing Association.